This is the third and final set of panoramas from my California trip in mid-July. The first was views of Los Angeles from the Hollywood Hills and the Getty. 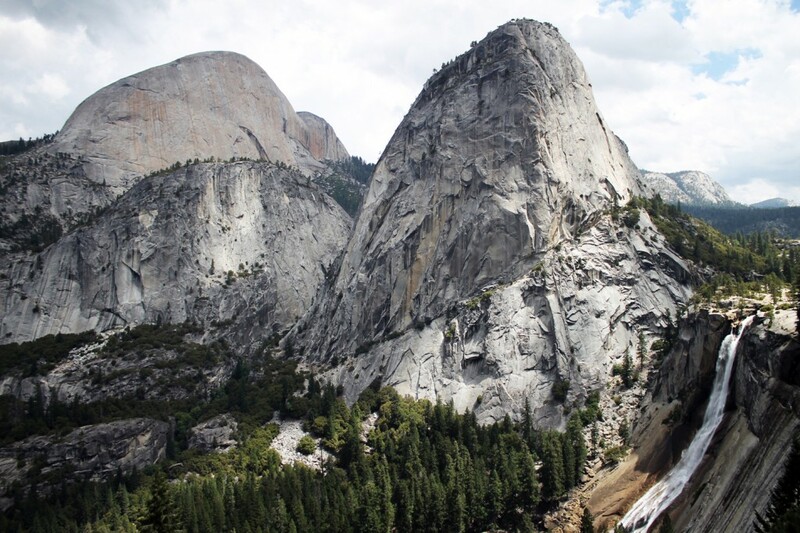 The second was Yosemite Part 1, with images of the meadows, Bridal Veil Falls, and Vernal Falls. This final part covers the multitudes of panoramas I took from the top of Glacier Point, an image of Yosemite Falls, and the giant sequoias that can be seen right near the park’s entrance. Reminder that you need to click on the image once, then click on the magnifying glass in your new tab or window to get the image at full size — and it’s totally worth that click. My uncle took us all up from the Valley about an hour to make it to the top of Glacier Point for the experience of seeing the sun setting over the valley from above. It’s worth the drive. These next few panoramas weren’t even at the top of Glacier Point, just a viewing stop about two-thirds of the way up. In this first one, you can see Half Dome to the left of the obstructing trees, and my sister is hiding in the shadow. You can also pick Nevada Falls and Vernal Falls out in these pictures, though Vernal Falls is mostly in shadow. Another 15 minutes or so up the road, and we arrived at the Glacier Point parking lot. Come close to sunset, and you can get a great talk from the rangers that gives stories about most of the peak names as the sun sets, golden and pink hues slowly creeping up and taking over the view. Here’s Half Dome from the top, zoomed in about 200 mm. You can see the golden lighting. That gold quickly gave way to pink. Here are my favorite peaks, zoomed in as far as I could go. The image is sharpened, but the coloring is unchanged. Here’s that same view with color enhancement, making it look earlier in the day if you prefer it that way. Zoomed in on the peaks behind Half Dome’s face here. Again, the first is untouched color, and the second is touched up. You can also see Nevada Falls near the middle of the image. And one last shot of the whole viewpoint before it got too dark. This was taken from the stargazing amphitheater. You can pick out Photoshop’s merging of the different photos pretty easily in this one. Usually, it’s a smoother merge! The next morning, we had an agenda for a few easy hikes that included Mirror Lake and Yosemite Falls. These are very short hikes, though there are mild inclines at both, for those of you with difficulty walking. Yosemite Falls does have a wheelchair accessible path as well. This is Mirror Lake, which is really Mirror Meadow at this point. It’s been slowly filling in with silt in a natural process. My uncle Mike and my cousin, Breanna, are on opposite sides of the water. On our last morning, we stopped at one of Yosemite’s meadows to take in that view again, at my sister’s request. So this is the last image from Yosemite Valley. Never fear! There are a few more photos. About an hour out of the Valley and close to the southern entrance to Yosemite National Park are the giant sequoias and a system of trails leading to them. My cousin Daniel and I went about 2 miles in, but we were tired after a week of hiking, so we didn’t venture farther. Here are giants we passed. Not sure if this tree had a name, but nice shot, eh? That’s it for the panoramas! If you want to see the rest of the pictures from my trip, you can view them here. There are a million gorgeous images among them–Yosemite is extremely photogenic, what can I say? If you want a higher resolution version of any of them, shoot me an email at becca@thegourmez.com. To end, I’m posting my favorite image of the trip below. It’s from the John Muir trail, with Nevada Falls on the right and Half Dome’s profile, the Liberty Cap, and another peak who’s name I can’t recall in the middle. It makes a great desktop wallpaper, not that I would know . . .